Tips to get a top quality blow up. Blow ups of DOUBLE 8mm into 16, of SUPER 8mm into 16 or 35mm, of 16mm or SUPER 16mm into 35, are all made on internegatives or intermediates that will be used for the printing of any number of release prints. A first timing is made at this step in order to get an internegative with the best density, which will be corrected even more precisely by the laboratory, when printing the first trial color composite, by any professional laboratory. Every optical print work is supplied with its daily print to allow an immediate check. This first print may be used for further editing and sound synchronization before the making of the negative soundtrack. This traditional technique, thoroughly tested, uses the original film but once and so, protects it from the multiple passages through the printer that direct blowing ups on release prints do require. The use of "inter" films offers another important advantage : as the classical effects ( fades, dissolves, freezed frame, slow or accelerated motion etc ) are performed during the blowing up. Extra passages in the printer are not required and the overall quality of the picture (graininess, contrast, color and sharpness) remains constant. Global quality of a blow up remains very dependent on the original. You will find some remarks and tips below. When the original SUPER 8mm is a reversal ,e.g. the Kodachrome K40, only 2 steps are necessary to get a 16mm, SUPER 16mm ou 35mm projection print. 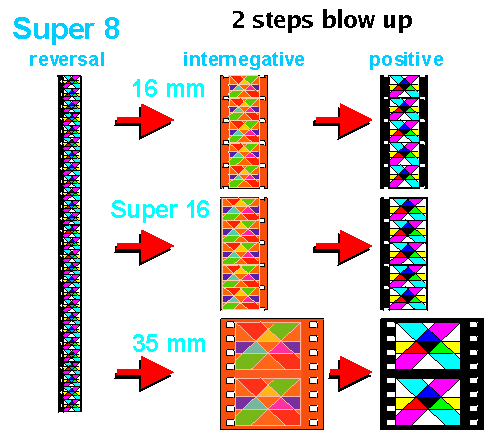 If the original SUPER 8mm is a negative, e.g. the KODAK MXR 200T, 2 printing steps are required : the blow up gives a POSITIVE intermediate from which is obtained the NEGATIVE intermediate which will be used to get the final projection prints. An original of mediocre quality will poorly withstand the process. Therefore some precautionary measures are necessary. of the different lenses likely to be used. When the camera has only one zoom lens, test at some specific focal lenghts. It often happens that optical quality will not be constant but will be the result of some compromises. Therefore it is interesting to determine the positions of the zoom to be avoided when filming with it at various fixed focal lenghts. The slight variation in sharpness cannot be seen while zooming. Failing specific test equipment, choose a subject with sharp geometrical lines, a building under contrasted lighting, for example. the simpliest test pattern for steadiness is a black cross traced on a white cardboard. It will be filmed the first time with the camera fixed on a heavy tripod. The test pattern will then be shifted a few millimeters horizontal and vertically. With the film rewounded in the camera, if it allows it, or in a darkroom, shoot the test pattern a second time. Both shooting must be underexposed by 1 diaphragm. When being projected, a lack a vertical fixity will show a relative movement of the 2 horizontal lines of the test pattern and indicate a problem of worn pin or loose rear pressure plate or yet expired emulsion. A lack of horizontal stability will show a relative movement of the 2 vertical lines of the test pattern. This will mean a bad lateral hold of the film in the aperture plate. In SUPER 8mm it isn't obvious to rewind the film in its cassette. In the darkroom however we can try manually to push a sufficient lenght of film towards the feeding compartment.. It is difficult to pack in more than 200 frames this way but that can be sufficient to project the test in a loop. This double exposure technique allows to free oneself from an eventual lack of fixity of the projector. mostly when dealing with an automatic camera because an allowance for tare of the cell can be necessary to avoid a tendency to under- or overexposure. If you have the choice between various types of emulsions. Sensitivity, contrast, colour, granularity can be deciding factors. It is all up to the chief operator's choice in accordance with the subject and previewed conditions of the shooting. I get very good results from a "sharpness" point of view using Kodachrome (40 ASA) but also Ektachrome (160 ASA) which allows shooting with little lighting and the graininess of which can be an interesting esthetic factor too. Only a fool refuses to change his mind. This applies to me as I must correct my opinion concerning the use of Super 8mm negative film for a blow up into 16, Super 16 or 35mm. Recent tests proved I was wrong to fear that there would be a total quality loss after the 2 operations of printing on intermediates. The first operation, the actual blow up, gives an intermediate positive which has to be printed on the same intermediate to obtain the negative from which the release prints will be made. Those tests on blowing up a S8 negative into 35mm have been quite surprising ! The only hitch is the increase of total price for the enlargment, due of course to the extra printing step. But the qualities of sharpness, colours and contrast are very interesting. Finally its greater sensitivity (200 ASA or 125 in daylight with a Wratten 85) allows shooting under lighting conditions previously considered impossible. I therefore advice film makers and film operators interested in Super 8, to try this "new" 7274 VXM. A two-minute test will be enough to be convinced. If possible try to order all the films you will need so that you will be working on the same emulsion number and if you can handle the stress of waiting for the rushes, try to limit the number of developments, stocking the exposed films in a fridge. Those fixity and emulsion tests will also allow you to check if the camera, the projector or the viewer are not scratching the emusion side. These scratches will show up in color and won't be able to be erased by the antiscratch printing which only works wonders when the scratches are on the back side ( black when projected). There is only one possible rescue : if a scratch on the emulsion side is outside near one edge of the picture, then the coefficient of blowing up can be increased in order to re-frame the picture without the scratch. of the aperture plate, of the rear pressure plate and of the optics for dirt. A grain of abrasive dust stuck in the bottom of the window while loading may result in a ruined shooting. must be frequently checked. If the camera is equipped with an automatic exposure system, it is often better to disengage it and use a reliable photometer. Otherwise it is important to carefully select the field of measurement and to lock the automatic system after the correct exposure has been determined. It is indeed very unpleasant to see a landscape suddenly get dark because a character wtih a white shirt on, moved into and filled part of the field. As much as possible use only one camera if you want to avoid the jumping of the frame when you go from a shot taken with one to a shot taken with the other. Even two cameras of the same make can show a slight difference in the positionning of the pictures behind the window of the aperture plate. That difference will be amplified by the blow up. On the other hand, if the optics are of different makes, you may find yourself with more or less cold or warm shading according to the optics used and their antihalation treatment. should be avoided as much as possible. Two-shots, close-shots and close-up should be preferred. of the frame is another factor for a better legibility. SUPER 8 cameras are in general too light not to pick up the simple breathing of the cameraman on a hand held shot. A tripod or improvised supports should be used as often as possible. The takes will be a little longer than strictly necessary (see further : "unused footage"). natural or artificial, should preferably be soft. Avoid the bright sunshine with its harsh shades. If possible use reflecting panels to "unblock" the shades. The reversal films are made for projection and are therefore strongly contrasted. The blow up by optical printing still increases, by its own nature, the contrast of the original. STUDIO GAMMA has perfected the process of "flashing" of the internegative to compensate for this phenomenon. The result has proved very satisfactory because if its action on high light is minimal, flashing improves the legibility of the details in the dark areas. Care and cleanness are of course rules number one. Splices can be done either with good cement or double-face scotch. The splicer must be in top condition and must perfectly align the two ends. Unfortunately I don't know any perfect splicer. They all lack a precision necessary to have a smooth passage of the splices during the blowing up. 1° leaving any amount of frames at the beginning and end of each shot. Those images too will be blown-up and the rush print of the blow up will be comfortably edited on a professionnal 16 or 35mm editing table. The splices of the internegative will hardly be visible in 16mm and invisible in 35mm. This second solution is preferable since the sound track and the image can be fixed with accurate precision. 2 ° systematically leaving 10 frames too many at the beginning and at the end of each shot. Those images will be jumped over during the blow up process and no splicing will be visible on the positive. This is the best solution if the editing doesn't have to be very precise. when preparing the blow up, systematic tests are made from original images. These tests of density and colour correction are processed and printed on positive at one single standard light. This traditional technique allows a precise evaluation of the required printer lights and is much easier to deal with than on a video monitor. In general, I have to select distinctive passages from the original to make those tests. 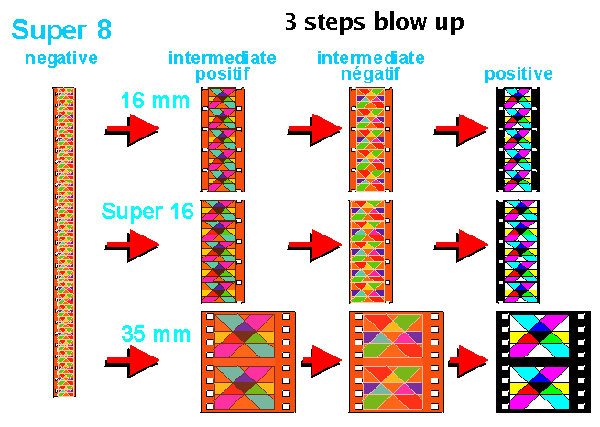 This implies successive loading and unloading the SUPER 8mm original which is not very easy to handle compared with 16 or 35mm. To avoid as much as possible all delicate handlings of the original, the ideal solution is the making of a short strip, when editing the SUPER 8, of about 10 frames of each shot, either at the beginning, the end or both when there is a big difference. That short strip looks like a very short version of the movie and can be used for the test in place of the original. are made during the blow up printing to ensure a perfect continuity in quality. A fade in, a dissolve, a freezed frame, etc can add a touch of finish difficult or impossible to add when shooting in SUPER 8mm. Of course this has to be planned while writing the script or at least during the editing. will simply be notified : "at the end of the 15th shot (short description) fade out in 48 frames" or "at the beginning of the 23rd shot (short description) fade in : 120 frames. Nota bene : a fade in from white or a fade out to white are in fact dissolves from or to white. while editing, you must take into account the necessary lenghts for the overlaps ! In some cases, the simple dissolve can be advantageously replaced by going from in focus to totally out of focus and the reversed, combined or not with a dissolve. cut the original x number of frames after the image that has to be freezed and splice a leader the length of which equals the time wanted for this effect minus those x extra frames. same technique : splice a leader representing the final lenght. It is good to know that a jerk becomes perceptible beyond 3 X, but an extreme and jerky slow motion of 12 or even 24 times can have an interesting effect though hard to describe. As slow motion are achieved be filming each image 2 times or more, it is thus impossible, as in video, to have a slow motion of 2.67 times for example ! can fix a bad camera angle, unnoticed during the shooting ( be careful with signs of particular direction : inscription, watch, etc...the inversion of which is impossible ). goes without comment. They can be combined with slow or acceleratd motion. shoudn't be blown up but (re)filmed in the final format, either in 16 or 35mm. The can be superimposed on images in motion or freezed images and include fades in and fades out, or even be animated (white letters only). Generally STUDIO GAMMA has its titles made by ANIWAY in Bruxelles. Contact : Jacques CAMPENS +32 (0)2 243 03 33 .
the blow up operation should ideally be planned while preparing the shooting. Contact with the blow up operator should be made at an early stage in order to avoid the small mistakes that could turn out to be serious problems later on. My main concern is to provide the best blow up possible. I am at the disposal of any production in need of further information.